O God, Who didst give to Thy servant Tobias, as the companion of his journey, thy holy archangel Raphael, grant to us thy servants that we may be always protected by his guardianship, and fortified by his assistance. Through our Lord Jesus Christ, thy Son, who liveth and reigneth with thee, in the unity of the Holy Ghost, God, world without end. Amen. Jesus, brightness of the Father! Life and strength of all who live! Hail, too, ye angelic powers! Guide of life, blest Raphael! Didst in links of iron bind. In His Paradise a place. In those days, the angel Raphael said to Tobias: For it is good to hide the secret of a king, but honourable to reveal and confess the works of God. Prayer is good with fasting and alms, more than to lay up treasures of gold. For alms delivereth from death, and the same is that which purgeth away sins, and maketh to find mercy and life everlasting. But they that commit sin and iniquity are enemies to their own soul. I discover then the truth unto you, and I will not hide the secret from you. When thou didst pray with tears, and didst bury the dead, and leave thy dinner, and hide the dead by day in thy house and bury them by night, I offered thy prayer to the Lord. And because thou wast acceptable to God, it was necessary that temptation should prove thee. And now the Lord hath sent me to heal thee, and to deliver Sara thy son's wife from the devil. For I am the angel Raphael, one of the seven who stand before the Lord. THE approach of the great solemnity, which will soon be shedding upon us all the splendours of heaven, seems to inspire the Church with a profound recollection. Except for the homage she must needs pay, on their own date, to the glorious apostles Simon and Jude, only a few feasts… break the silence of these last days of October. Our souls must be in conformity with the dispositions of our common mother. It will not, however, be out of keeping to give a thought to the great Archangel, honoured to-day by many particular churches. We too will celebrate the blessings of heaven. 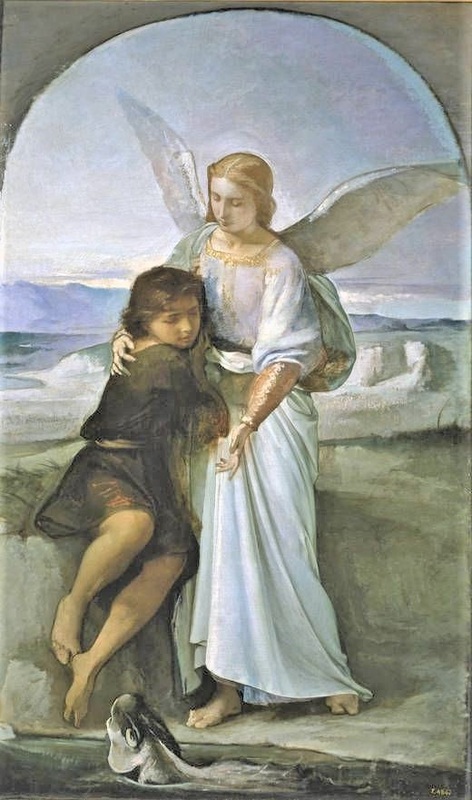 For as surely as Tobias beheld with his bodily eyes the Archangel Raphael, we know by faith that the angel of the Lord accompanies us from the cradle to the tomb. Let us have the same trustful confidence in him. Then, along the path of life, more beset with perils than the road to the country of the Medes, we shall be in perfect safety; all that happens to us will be for the best, because prepared by our Lord; and, as though we were already in heaven, our angel will cause us to shed blessings upon all around us.